In 2015, startups benefitted from a vibrant fund raising market. In 2016, I believe they will enjoy a very active acquisition environment. 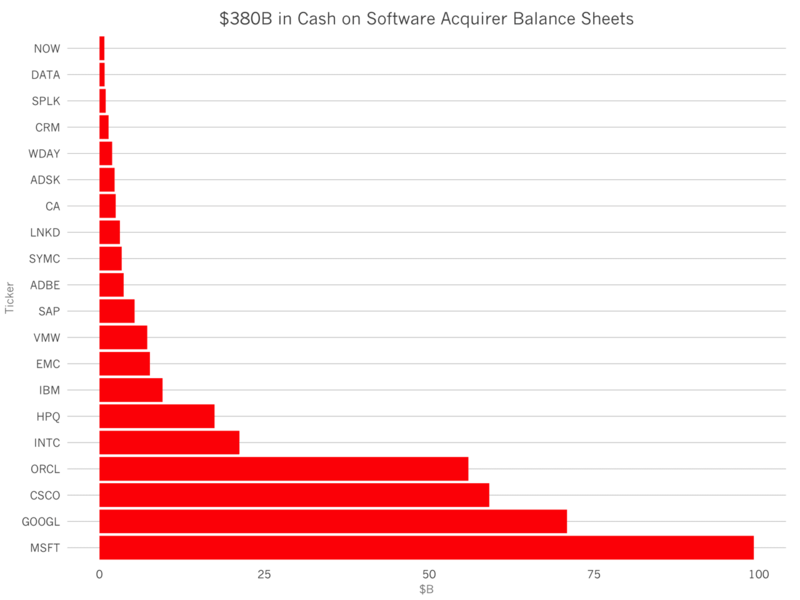 The roughly 60 or so publicly traded software companies hold more than $380B in cash and short term investments on their balance sheets. Though Microsoft, Google, Cisco and Oracle possess 75% of that cash, 14 other companies have cash reserves of greater than $500M. 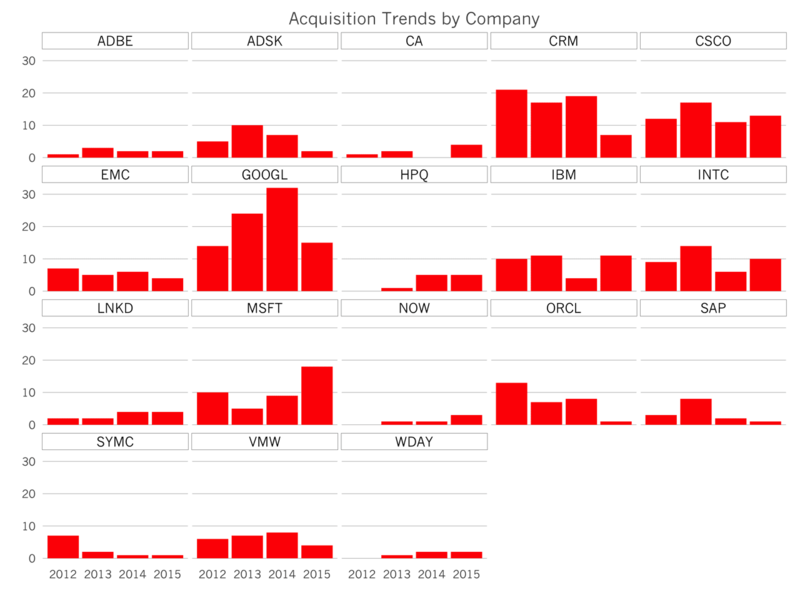 If we examine the M&A activity measured by number of acquisitions announced through November 28, 2015 across the largest 18 businesses, we can see Google and Microsoft have become increasingly acquisitive over the past few years, with Microsoft setting nearly doubling the number of acquisitions since Satya Nadella took the helm as CEO. In addition, newer entrants like Workday and LinkedIn are beginning to enter the fray as their businesses continue to grow, their product scope expands and they accumulate cash. Meanwhile, Oracle and SAP’s activity has waned. These older businesses acquired substantial businesses in the past and have historically consummated the largest transactions, including SAP buying Concur for $8.3B, Oracle buying Responsys for $1.7B, among others. Salesforce also pursued a more measured acquisition pace, and dropped to fewer than 10 acquisitions in 2015 to date, less than half of last year. This could be because of the dramatic increase in private SaaS valuations in 2015. If there are to be massive acquisitions of software companies in 2016, this list of roughly 20 companies are likely to be buyer. Their significant cash positions and substantial market caps enable them to swallow a $1B acquisitions. Newer companies, like Splunk, Service Now, and Tableau, each with market caps of greater than $7B and more than $500M in cash have the capacity to acquire startups for multi-hundreds of millions. Netsuite, also with a market cap of about $7B has $372M in cash, and is also another acquirer to watch. With substantial amounts of cash in their coffers and some very large market caps, there are more than 20 software companies of note who could be quite active in the startup acquisition market in 2016.